THE “Lucky Sperm Club”, as Warren Buffett likes to call it, is still going strong in the commanding heights of business. On opposite sides of the Atlantic, Ana Botín and Abigail Johnson have recently succeeded their fathers in filling two of the most powerful jobs in finance, as chairman of Banco Santander and chief executive of Fidelity Investments, respectively. Founding dynasties run, or wield significant clout at, some of the world’s largest multinationals, from Walmart to Mars, Samsung to BMW. Half a century ago management experts expected the hereditary principle to fade fast, because of the greater ability of professionally-run public firms to raise capital and attract top talent. 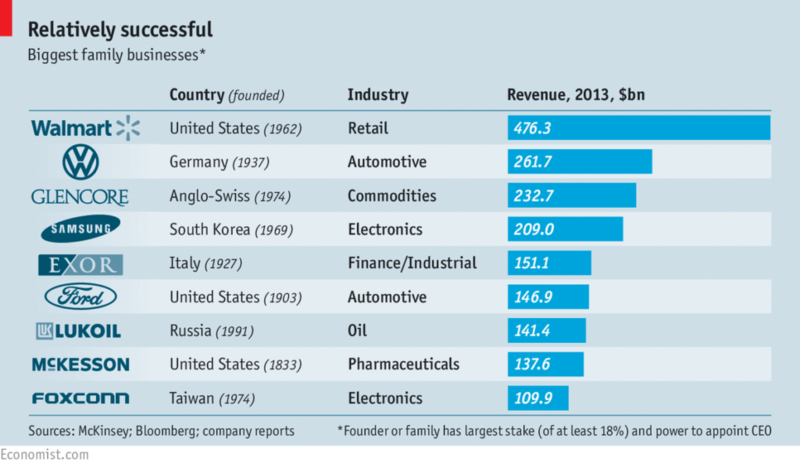 In fact, family firms have held their ground and, in recent years have increased their presence among global businesses. Family-controlled firms now make up 19% of the companies in the Fortune Global 500, which tracks the world’s largest firms by sales. That is up from 15% in 2005, according to new research by McKinsey, a consulting firm (which defines such firms as ones whose founders or their families have the biggest stake, of at least 18%, plus the power to appoint the chief executive). Since 2008 sales by these firms have grown by 7% a year, slightly ahead of the 6.2% a year by non-family firms in the list. McKinsey sees these trends continuing for the foreseeable future. This is largely because of rapid growth in big developing economies where family ownership is the norm among large businesses. Since 2005 the countries that have most increased their share of the Fortune Global 500 are Brazil, China, Russia, South Korea and Taiwan. By 2025, McKinsey forecasts, there will be more than 15,000 companies worldwide with at least $1 billion in annual revenues, of which 37% will be emerging-market family firms. In 2010 there were only 8,000 firms worldwide of this size, and only 16% of them were family-controlled and from emerging markets. Around 85% of $1 billion-plus businesses in South-East Asia are family-run, around 75% in Latin America, 67% in India and around 65% in the Middle East. China (where the proportion is about 40%) and Sub-Saharan Africa (35%) stand out for their relatively low share of family firms, because in both cases many large firms are state-owned. However, even in the rich world, big family firms are defying expectations of their demise. The tendency for founders and their heirs to abandon control to faceless institutional shareholders seems to have reached a limit. Of the American firms in the Fortune Global 500, 15% are family ones, only slightly less than in 2005. Among them is the world’s largest family firm, Walmart, in which the children of the late founder, Sam Walton (pictured, third from left) are still big shareholders. His eldest son, Rob, is the chairman, another son, Jim, is also on the board and their sister, Alice, also inherited a huge stake. In Europe, 40% of big stockmarket-listed companies still have a controlling family. However, one reason why the experts’ predictions of 50 years ago have proved wrong is that stockmarkets and regulators have been so accommodating in letting founding families retain a fair degree of control despite selling large stakes to outside investors. One way they have done so is through special classes of shares—a trend that has lately featured in a number of technology-firm flotations: who knows, perhaps in future Facebook will be controlled by the Zuckerberg dynasty and Google by the Page and Brin clans. Investors have accepted such arrangements as the price of getting a slice of these firms’ profits, but they rarely like them. Besides being able to access capital markets without losing control, there are at least four other reasons why so many big firms have defied expectations and stayed under family control. One is that they are often the product of a superbly talented entrepreneur like Sam Walton. While such founders are alive and on form, the combination of their abilities and the freedom they have as controlling shareholder to run by their own rules often gives them a strong competitive advantage. Even after they are gone, their heirs can keep up the firm’s success, simply by continuing to follow the founder’s successful principles. They also tend to have better labour relations, according to studies by Holger Mueler and Thomas Philippon of New York University’s Stern business school. This may be because workers are readier to believe promises that they will be rewarded for delivering in the long run, if such pledges are made by founding families rather than outsider bosses who may be gone in a few years. And in situations where businesses have to push through efficiency improvements, family owners may be more willing to act firmly when dealing with labour unions, because of their significant stake in the business, than salaried outsider bosses, the studies suggest. These are advantages especially in countries with generally hostile relations between workers and management, say the two economists. There is evidence of a positive “family effect” on financial performance, according to a new study by Cristina Cruz Serrano and Laura Nuñez Letamendia of IE business school in Madrid. They calculated that €1,000 invested in 2001 in a portfolio of publicly traded family firms in Europe, weighted by market capitalisation, would have generated €3,533 by the end of the decade, compared with €2,241 from a portfolio of non-family firms. The difference is equivalent to five percentage points of extra return per year. 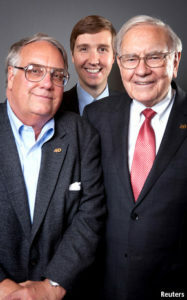 All this may be why, for all his professed disapproval of the Lucky Sperm Club, Mr Buffett wants his son, Howard (pictured, left, with his son, Howard Warren Buffett, an academic) to succeed him as chairman, and guardian of the firm’s culture. The elder Mr Buffett is such a big fan of family firms that he likes to buy them: in October he bought Van Tuyl Group, America’s largest family-owned car dealership chain. As with LVMH and Kering, two family-run French luxury-goods giants that have bought a number of European fashion houses, Mr Buffett’s spiel to founding families is: if you want to sell up but want your business’s culture preserved, it will be in safe hands with us. In some cases even strong and successful firms can implode soon after a generational succession, which is why so many countries have some variation of the saying, “from shirtsleeves to shirtsleeves in three generations” (clogs to clogs, kimono to kimono). Edelman’s survey found that the public’s trust in family firms falls once the baton is passed from the founder to the next generation. Alarmingly, a study of 2,400 family firms in 40 countries published last month by PwC, a consulting firm, found that only 16% of them had a “discussed and documented” succession plan in place. However, sometimes children do not want to join the family business, or turn out not to have inherited the entrepreneurial genes of the founder. It may then be in the best interests of the firm for a professional to run it, rather than a reluctant or incompetent scion, even if the family retains some control. Letting professionals take over can make a lot of sense. Talented managers are more likely to join a firm where there is a chance of getting to the very top, or at least where they do not have to work under a useless heir. Some 40% of the family firms interviewed by PwC said that professionalising their business was among the main challenges they face in the next five years. In the rich world there is a strong contingent of firms which have demonstrated an ability to get the best out of being both family-controlled and professionally run. In some emerging markets, however, things are not so clear. Many of their big firms are still run by a founder with strong links to those in power, and only time will tell if they have what it takes to survive the passing of either the founder or the regime. However, the positive examples of Tata in India and Samsung in South Korea suggest that it is possible, even in places with a strong tradition of crony capitalism, for world-class, professionally run family firms to emerge. Correction: This article originally said that the late Emilio Botín had struck a deal which allowed his daughter, Ana, to succeed him as chairman of Santander. In fact, no such explicit agreement was struck, although Ms Botín does indeed now chair the Spanish bank.